The basal ganglia is a collection of interconnected subcortical nuclei (neuronal cell bodies) lying deep below the cortex. 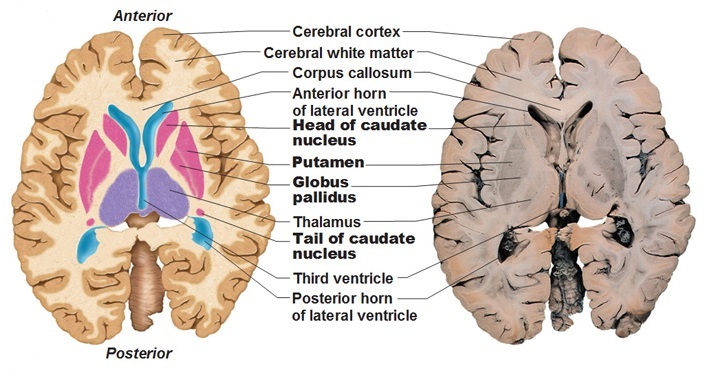 It is composed of the caudate nucleus, the putamen, the nucleus accumbens (or ventral striatum) and the globus pallidus. Input nuclei:caudate nucleus (CN), the putamen (Put), and the accumbens nucleus (Acb) are all considered input nuclei. 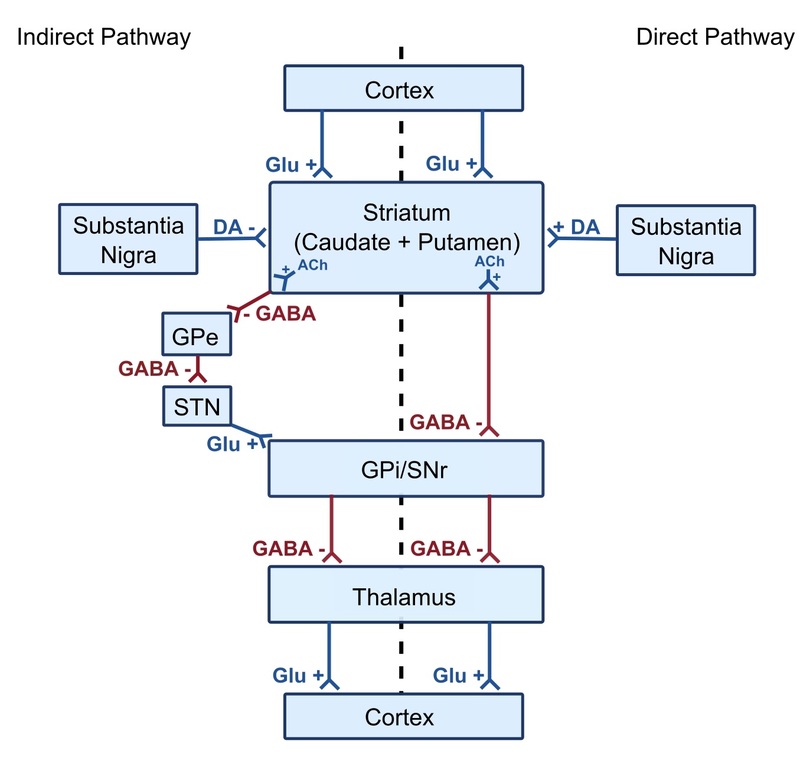 Output nuclei:send basal ganglia information to the thalamus and consist of the internal segment of the globus pallidus (GPi) and the substantia nigra pars reticulata. The putamen (laterally) and globus pallidus (medially) which together form the lenticular or lentiform nucleus (lens shaped). The caudate and putamen are also called the neostriatum or even referred to as caudate-putamen as a single entity. They communicate across the anterior limb of the internal capsule by fbrous strands that cross to connect these structures and so gives the area the name of the corpus striatum. Functionally the caudate and putamen are similar. The putamen is the larger ovoid mass which lies laterally with its lateral side separated very slightly from insular cortex and the external capsule and claustrum. Medially attached to the Globus Pallidus. The Globus Pallidus is smaller triangular shaped structure and lies medially with its medial relation being the internal capsule. The globus pallidus is a major source of output from the basal ganglia. It is divided by a lamina into Globus pallidus externa and interna. Subthalamic nuclei are also part of the basal ganglia. Damage here can lead to dyskinesias and hemiballismus and associated motor disorders.